Backed by our adroit team of professionals, we are able to provide our clients with an assorted gamut of Block Bottom Bags. This bag is made without adhesives from coated polypropylene fabric. Provided bags are available in different patterns that meet customers demand. 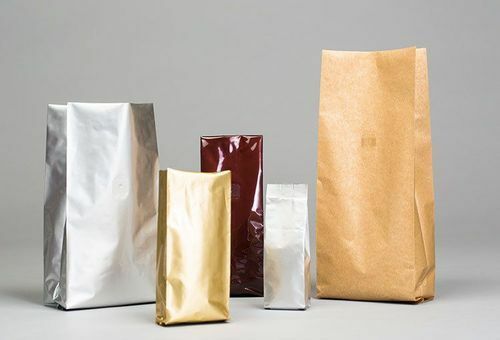 To keep the quality, these bags are checked on many parameters of quality. These are available in White or Brown, and in a great assortment of various sizes. These bags are ideal for use within chemists, pharmacies, groceries, gift shops and much more. For more information, please click on one of the bags listed above. We have carved a niche in the market with top of the line packaging items. We are into manufacturing engineering films and laminations of various films. The foils are used to make packages that comprise high barrier substances. The packages are made of nylon BOP, Nylon, Paper, CPE, 3layer & 5layer co-ex PE,BOPP, PET, CPP, Aluminum foil highbarrier productsare used in the packaging of dry frozen and snack foods. Foil pouches and Zip lock pouches are used in packaging of food items. Agricultural items are also packaged. These pouches and bags come in a various style ranging from gusset pouches and plastic pouches that come in use for storing oils or any liquid substances. The pouches also come with holes or vents to keep the food fresh for long. The printed pouches are printed both on the front and the reverse. We also company also manufacture flexible packaging material for several products in the market. Zipper pouches are best to store food items such as snacks, as their freshness remains intact for long. Apart from these we are also manufacture standup pouches and spout pouches which find its various uses in packaging of pickles ,mouth fresheners or any dairy products . In the case of packaging of bottles, induction current is passed to the metal liner in the plastic cap and the bottle is filled. Finally the cap is put on which comprises of induction seal wads which seals the bottle properly. The company manufactures a wide range of products to suit all the requirements in the FMCG industry. The various products of Shako Flex are quite popular with several top notch FMCG companies.